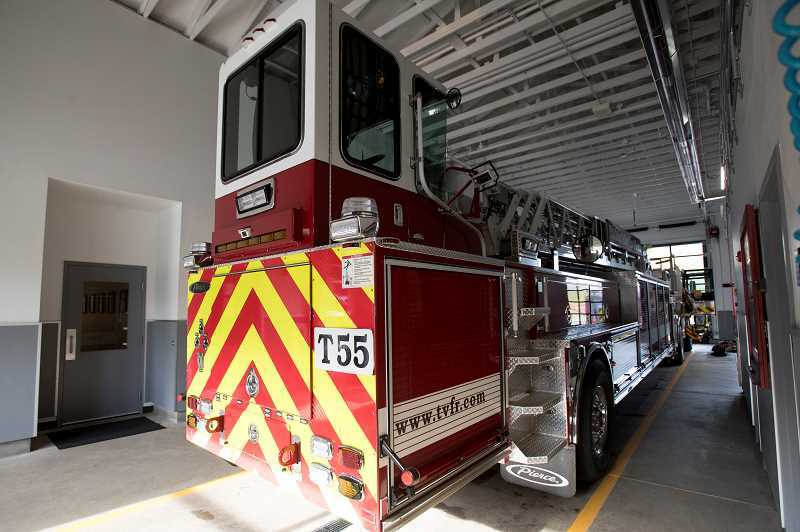 It would be easy, at first glance, to walk into Tualatin Valley Fire & Rescue's new Station 55 in West Linn and wonder if someone made a mistake. Stretching across half of the engine bay is a 60-foot-long, 76,000-pound tiller truck equipped with a 100-foot ladder. The gargantuan apparatus, which takes two drivers to operate, looks best suited for a heroic rescue operation at a 10-story building rather than bucolic single-family homes in the hills of West Linn. But focusing on the fire-expunging aspect of the truck is akin to valuing a Swiss army knife only for its blade. 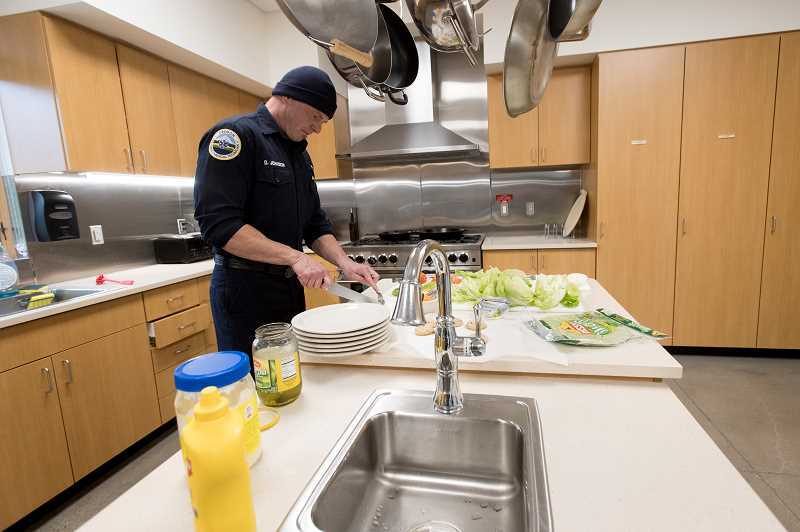 And if you spend time at the new station — which opened on Hidden Springs Road in August — you'll find that the truck is essential to TVFR's operations. "We as an organization will run 99 percent of our calls in this ladder truck," Lt. Ryan Stenhouse said. 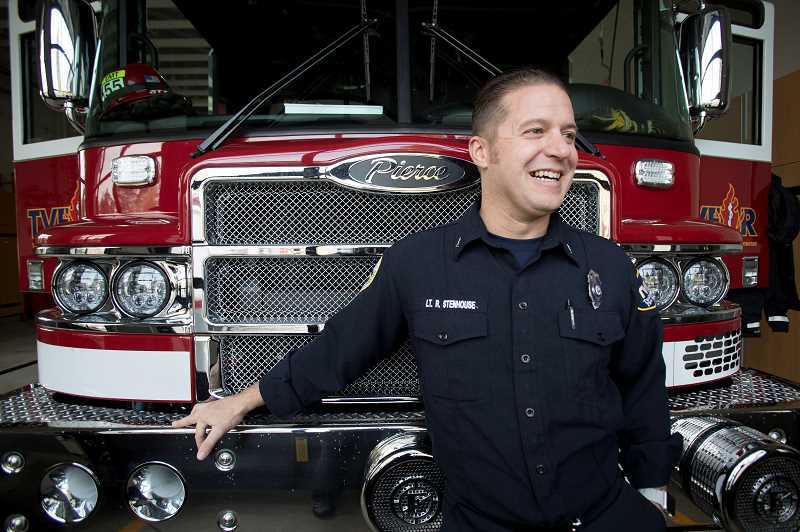 "We have two other fire stations in West Linn — there's one down in the Bolton area and one in Willamette. Both of those are fire engine (stations) and we're one-of-a-kind with the ladder truck here in the city." The truck has plenty of useful fire features, and Stenhouse noted that the long ladder makes it much easier to reach the roofs of homes — particularly in the hills. "When we arrive on the scene of a fire, my primary task is going to be searching for victims in the unburned areas of the home," Stenhouse said. "Two of my other firefighters' primary tasks are going to be going to the roof and ventilating — cutting a hole in the roof. We also do salvage and overhaul — we're really good at (saving) people's belongings. "That's the kind of stuff we do as a ladder company that engine companies might not be focused on." But Stenhouse said about 75 percent of the calls to Station 55 have been medical-related, and that jives with data from a mid-year incident report for West Linn's other two stations — 58 and 59 — showing about 80 percent of the 782 calls from Jan. 1 to June 30 for emergency medical services (EMS). Response time is crucial for those calls, and both the presence of the ladder truck and the hilltop location of Station 55 are invaluable for responding to a wide array of medical situations. "We've already made a difference up here," Stenhouse said. "We've basically cut the response time in half up here, which is really important." That's in part because — while it may be enormous — the tiller truck is actually easier to maneuver than a standard fire engine. But mainly, the engines no longer have to climb the hill from either Bolton or Willamette. "There are areas when you head towards Marylhurst (Drive), Stafford (Road), Rosemont (Road) which would be a longer response for those two fire stations," Stenhouse said. "We're a lot more centrally located for those responses." Having another ladder station is beneficial for the entire TVFR district; of the 27 fire stations, only three have a tiller truck, which means Stenhouse and his three-person crew — who rotate in for 24-hour shifts every three days — also respond to calls outside West Linn when the need arises. Over the course of about three hours on a crisp and clear Thursday afternoon, no calls come in to Station 55. Stenhouse and his crew — which includes paramedics Aaron Zahrowski and David Schurter as well as firefighter/EMT Dave Johnson — responded to a car accident in Oregon City earlier that morning, and Stenhouse is always keeping his ear to the radio. "We listen to the whole fire district, because that keeps us in tune with what's going on at all times," Stenhouse said. "I want to know when engine 58 from Bolton has a medical call, or an incident they're responding on. Part of that is in case I hear another call come in, or (so) I know where 58 is going to be in case they need help." On average, Stenhouse said the station receives around three calls a day. "Every day is different," he said. "We do have those days where we'll take six or seven calls, but it varies, and you can never tell why. Traditionally stormy days can create more call volume — downed wires, trees into houses, stuff like that — but we haven't really experienced that here yet. Obviously winter is coming, and that's another key element to having this fire station up on the hill." Even when calls aren't pouring in, crew members have plenty to keep them busy. Just before lunch, for instance, Schurter squeezed in a workout while also watching a training video on intraosseous infusion (a process of injecting fluids or medication directly into a bone as opposed to a vein). On other days, the crew checks each piece of equipment that's stored on the tiller truck — everything from saws to medications, steel-cutters and, naturally, water. "We start everything up, we run every tool, we make sure it's fueled properly — you name it, it gets looked at," Stenhouse said. The crew hasn't been together long, but it's already becoming the "second family" that Stenhouse says is crucial for the hob. "I try to tell people if I spend 30 years in the fire service, I will spend 10 years of it in the fire station," he said. "So that's 10 years away from my family, holidays, going to kids' baseball games. That's a commitment I've made to the community, to be here."